You will be cutting perfect, I mean perfect miter cuts, within one hour of watching this DVD of mine. Please take this Quiz to see where you score on the DIY Crown Molding Installation Scale! Is your spouse still talking to you? Are You Kidding Me? Does Growling Count? If you answered Yes or Are You Kidding Me? in two or more of the questions above, you need my Crown Molding DVD. This DVD was shot with High Definition television equipment by a professional film and video company. It is fast-paced and will show you step-by-step how I install crown molding in just about every situation you can imagine. Beware of other DVD products out there. Some are produced using a common homeowner video camera bought at a local electronics store. 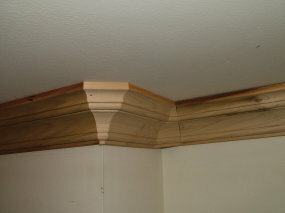 To make matters worse, some only cover one aspect of crown molding: inside and outside corners. No Tedious Coping Required! Why? To create the cut line you follow with the coping saw, you have to cut the molding in the miter saw the way I show you in the DVD. Why waste time coping when you already have a perfect fit? No other publication I know of shows this trick to perfect fits in corners using just a miter saw! If you want perfect crown molding cuts, then you will agree the price is well worth it. Heck, you may have already wasted three times that amount in the scrap trim lying around your saw. Or did you hide those pieces to stave off potential embarrassment? Click the button below to add the Crown Molding DVD to your wish list.